Religion can be fun, it appears, when Buddha followers get funky. 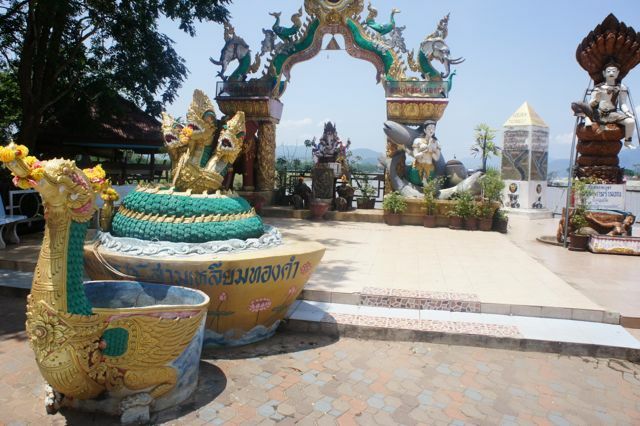 Chiang Rai, Thailand, is a fantasy trip of extremes and expenditures. Everyday folk who happen upon good fortune turn their faith into exotic and humorous displays of gratitude, not only to the four Buddhas (depending on which path is followed), but also to the Royal Family who generously runs this country. 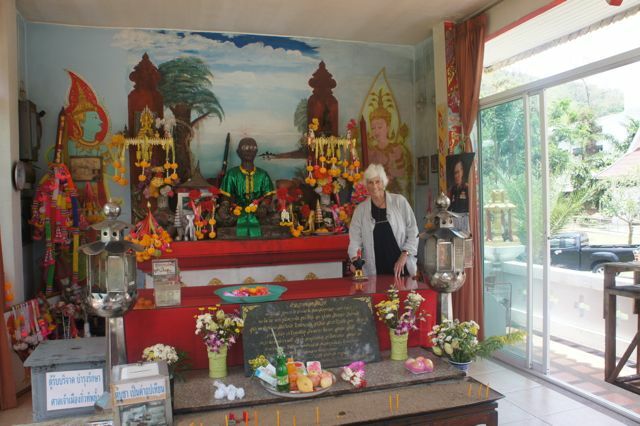 I’ve already told you about the Black House buy a national Thai artist putting a new bent on spirituality. But also in Chiang Rai are two more “temples” that blew my mind. The simpler of the two is the chicken spirit house (remember Thailand is a web of spirit houses ranging from doll house size to complete complexes in order to appease the bad spirits and keep them out of the house.) by someone who seems to reverence roosters. It certainly made me laugh - and I hope my deceased father and brother are also laughing - because my family had been in the chicken business for many years. 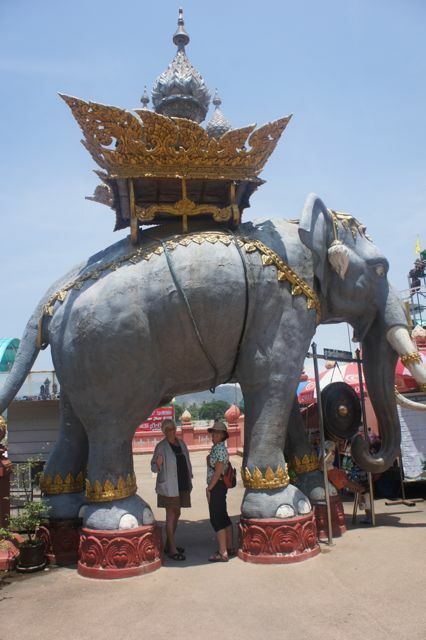 Along the roads of Thailand are various “shops” where a believer (or non-believer) can purchase empty spirit houses and giant animals - be it elephant, zebra, donkey, tortoise, or preening roosters taller than me. There are all sizes of these beast from tiny statues to huge ones, and they are identical images - a tiny chicken statue is the same image of the giant ones but maybe colored differently. 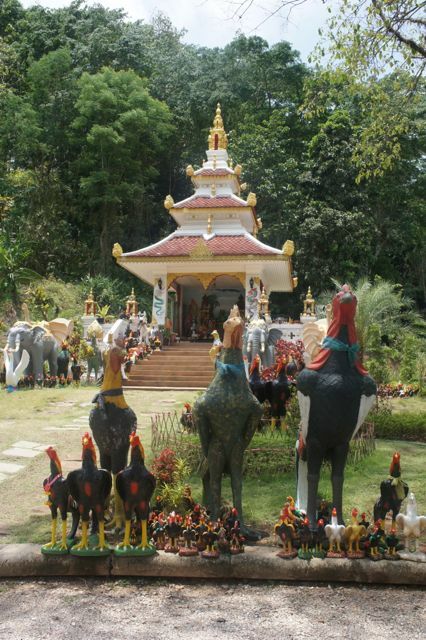 Well, when we arrived at the Chicken Spirit House, I was awed by the amount of these animal statues (not just roosters but elephants, and all sorts) - I estimate at least 500 - grouped in patches on the lawn, at the entrance, up the stairs, and a few in the temple itself. I had to get on this bandwagon, with my family chicken experience - I won’t even eat the bird anymore. In front of such a display is someone with a table and a couple of shelves (outside under a tent) overloaded with possible purchases. 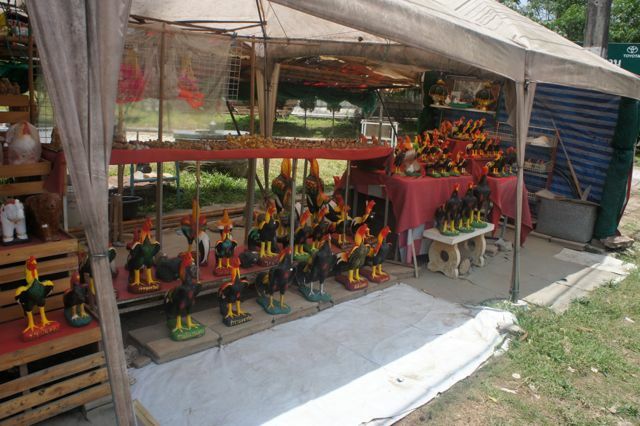 These red, black, green and gold roosters on a base, actually had petitions written in Thai on that base - like happiness, successful business, gain lots of money, and other such rather greedy petitions. 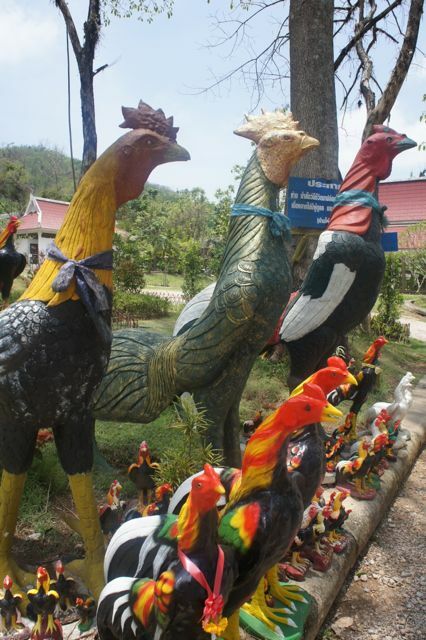 I purchased a $5 rooster about a foot tall with whatever the Thai word is for Have a Good Time on its base. I figured this was appropriate in the name of my father and brother who have already passed into the heavens. One lights 3 strands of incense, and 3 candles (Love the trinity) and takes the statuette up the stairs crowded with these animals to the altar - or you could put it among the herds grouped on the grass. At the altar is a statue of the guy who had this fetish (sitting in the yoga pose) and someone had put a pair of glasses on him. Strange things can be seen in these spirit houses. Many of the Hill tribes believe in animism and shamans. But it’s hard to discern for what they are praying. I know roosters are early rises and regular - I hear them every morn. Another stop was a little road-side entertainment at the point of the Golden Triangle further north. I mentioned this area once home of the opium trade yesterday and will again. But sort of squeezed in between road and river is another enormous altar to a shiny golden sitting Buddha high above reason and accompanied by a pair of enormous plaster elephants for which children can climb up a few steps to enter into a royal saddle box for a photo shoot of “being on an elephant.” Another pair of giant gray elephants at the entrance one walks under the belly for good luck. There is also a giant Alice in Wonderland style tea pot - symbol of the restoration project to divert farmers from opium fields to tea fields. All this crammed on a slim sliver of a park between road and river has the ambiance of being on a giant long boat made mosaic-style of stained glass. The whole shebang is a tribute to the Royal Family, and especially the King’s mother. 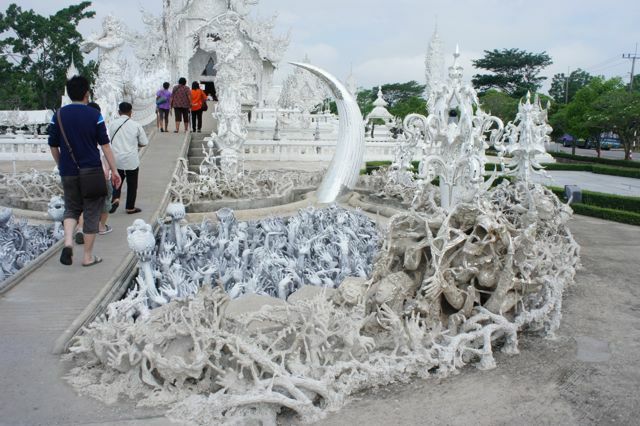 However, the creme de resistance is a overwhelming project called the White Temple or Wat Rong Khan in Chiang Rai. This is a true WOW! It’s inconceivable that a respected national artist decided 16 years ago to begin a project that would take 90 years to complete, knowing he’d miss out on the celebration, (he is about 63 now). This is kitsch at its most glamorous. 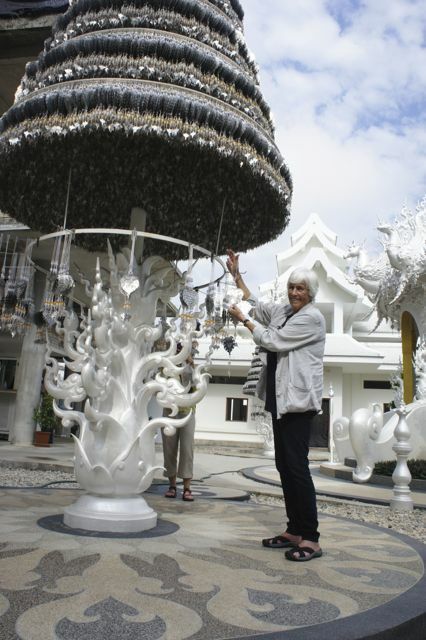 Artist Chalermchai Kositpipat has built exotic white temples trimmed in glass and ornament like I’ve never seen, and it goes on and on and on. Everything has a reason. This spiritual journey of the artist doesn’t give answers but poses questions. There is one way to enter and it’s one way - like the road to heaven should be. The visitor walks through “waters of hell” where pools of white hands (500) are reaching for a last breath (one has a single painted red nail on the middle finger that’s the universal sign) called Beauty of Anguish. 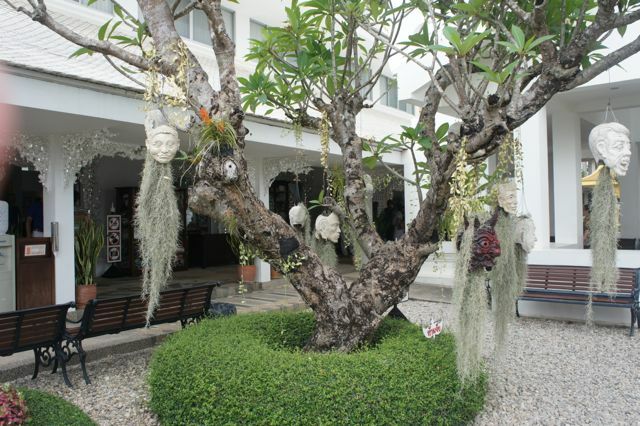 Freaky white skulls, monster heads, nightmare faces hang from frangipani trees and even the Virgin Mary, Spiderman and George H Bush riding a missal are included somewhere in this massive spirit house. Silver and glass mosaic trim glitter in the sunlight. 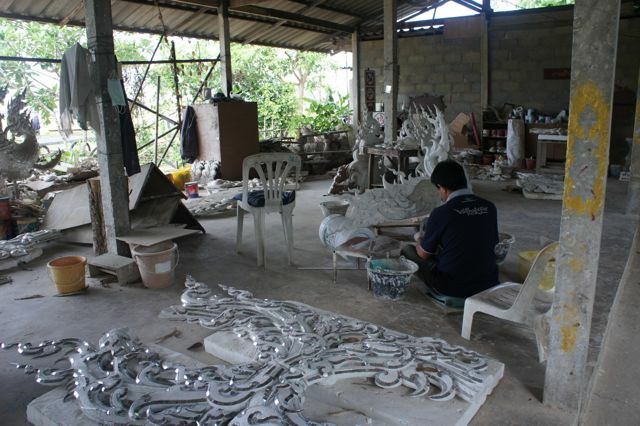 You walk the walk looking at all the curlique details and the enormous amount of work which is really done by a team of students who are making the needs of the artist as he slowly works on this project. The workshop is open for a behind the scenes look at the intense repetitive labor. So much is not finished. There are new buildings and a monastery still in the concrete stages and a massive field to eventually be a parking lot (maybe the size of St. Peter’s Square) and room for more temples to honor God. There is a gold building where the bathrooms are located (?). Apparently gold is good but the toilet style is still hole in the ground. And the major temple is filled with the artist’s murals of monsters and paradise which have heavenly intent, sort of like the Sistine Chapel but in gold and pastels. He seems to want us to know it’s a rocky road to avoid the temptations of the devil, hell is always a torturous choice, but there is a kingdom of glory beyond the imagination, although Mr. Kositpipat is trying to give you an idea. What catches your attention, if all this imagining doesn’t, is that the artist is creating this as his life project with his own money. He doesn’t accept large donations but you can buy books of his very spiritual Buddhist-style paintings modernized. He has a large art gallery on the property which also houses a collection of Ninja type knives he has made (as did the Black House artist) and other objects. Apparently he continues to paint (has had to reduce his personal output from 300 works a year to about 6) and when he does, his palate and easel await in one of the buildings in progress. 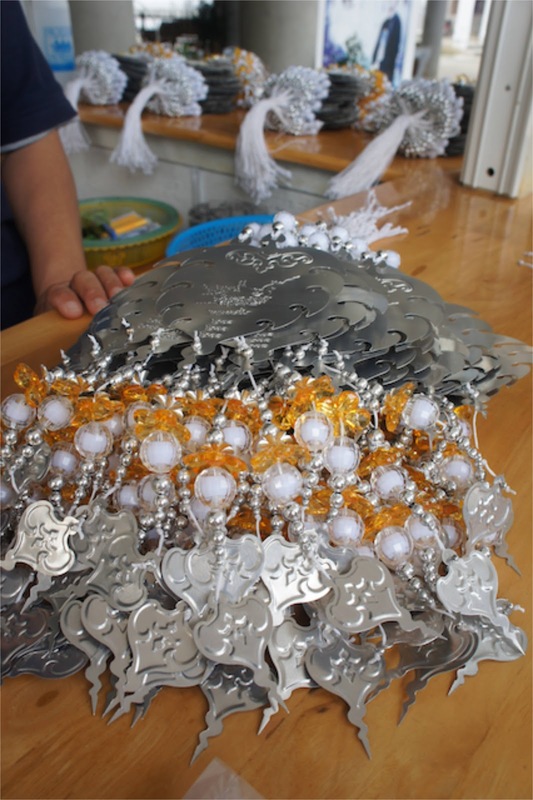 The best participation one can do is buy one of the metal “prayer” forms from the umbrella tree. It’s awesome. There is a table with sharpies and you can write your prayer and hang the ornaments (like something you’d put on your Christmas tree) on the prayer tree. At the very moment (unknowingly) the Grizzlies were fighting for victory over the Thunder, I hung one of these with “Go Grizz” on the tree. And they won! Wow. My hats are off to this man for this vision and his spirit. It’s something once seen, the brain doesn’t toss away. Here you don’t have to leave an offering. It’s all his creation. In our last comment, we suggested you might find another temple so you can continue to make offerings and/or pray for the Grizzlies. Seems like your first offering and prayer for the Grizzlies at two different temples were both dedicated to Game 2 last night. If so, you have to do this again for Saturday's game.